DC Password And Encrypted Data Manager Doc - Bank Records - Douglas Computing, Inc. When you click on the Banks node of the navigation tree, on the left of the DC Password And Encrypted Data Manager, you will see the following screen. This section of the application, allows you to store information for any number of bank accounts you may have. Note the following information on how you can go about doing so. You can store a PIN value associated with a bank account, in the PIN field. By default, the value is hidden. To reveal the value, you may click on the Show PIN button, in the middle of the ribbon bar. Clicking on the Show PIN button again, hides the PIN value in the field. You may use the Show PIN button to toggle between hiding the value in the PIN field, and showing it. The DC Password And Encrypted Data Manager allows you to hide the note for your Banks record, the same way it hides your PIN - with bullet characters. To hide the note for you Banks record, click on the Hide Note button, in the middle of the ribbon bar, so that it remains in a depressed position. To reveal your note, click on the Hide Note button, in the middle of the ribbon bar, so that it remains in an undepressed position. The Hide Note button toggles between hiding your note, and revealing it - see screenshots above. 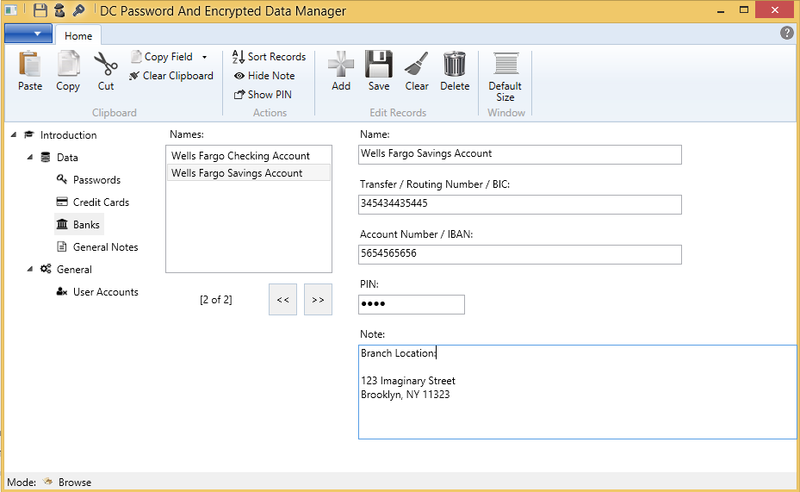 Apart from the regular tools that are available to copy, cut, and paste data from or into the application, the DC Password And Encrypted Data Manager allows you to copy whole field values from records. Specifically, you can click on the down arrow of the Copy Field button, on the ribbon bar, and select any bank record field, to copy the field's whole value to the clipboard. The DC Password And Encrypted Data Manager, includes a Clear Clipboard button on the left of the ribbon bar, to clear any value you may have previously copied to the clipboard. This can be used for example after you copied a PIN value to the clipboard, to paste it into a field in a browser. Clearing the clipboard can be used as a counter measure against attackers, using tools to retrieve data from your clipboard, in an effort to gain access to your confidential information. After you have created a new record, or modified the name of a record, you may want to sort your records to make it easy to find them afterwards. To do this, simply click on the Sort Records button in the middle of the ribbon bar.